The same functions are actually already available in other modules (e.g. A-114, A-148, A-170). But in many systems it's not necessary to have two ring modulators (A-114) or two S&H units (A-148) or two slew limiters (A-170) available. That's why we have compiled these function in one small 4 HP module. 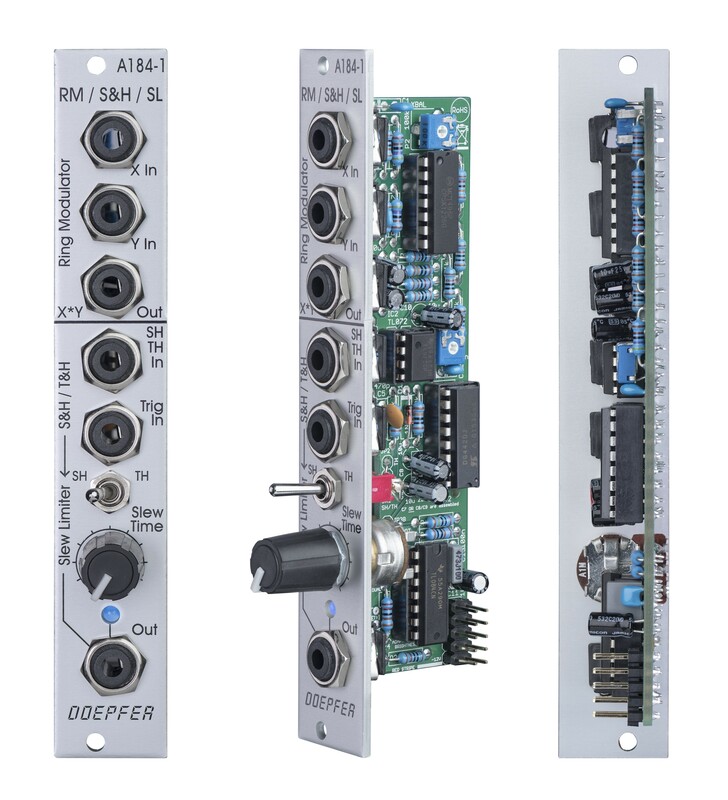 A-184-1 is the combination of three functions which are actually already available in other modules (e.g. A-114, A-148, A-170). But in many systems it's not necessary to have two ring modulators (A-114) or two S&H units (A-148) or two slew limiters (A-170) available. That's why we have compiled these function in one small 4 HP module. The lower section is a Sample & Hold (S&H) / Track & Hold (T&H) unit followed by a slew limiter. An internal jumper is used to set the mode to S&H or T&H (in the final version a switch at the front panel will be added to select between S&H and T&H). In S&H mode the unit picks out a sample from the voltage at the SH input at the rising edge of the trigger signal input. In T&H mode the output follows the input voltage as long as the level of the trigger signal is high. As soon as the trigger signal turns low, the last voltage is stored. The trigger input is internally normalled to high, i.e. the unit works just as a slew limiter in T&H mode when no trigger signal is applied. he custom version is only a design study made with a self adhesive foil printed by a color laser printer. There are no plans to offer this version of the module. But you may use the Coreldraw file on our website A100_System.cdr to design your own front panel. It includes all currently available front panels and you may add your own background or change the size, font or color of the lines, words and symbols. That way a personal module custom module can be realized by printig the design on an self adhesive foil (e.g. Avery Zweckform 3480) and stick the foil to the module. For this the module has to be dismantled. Knobs in different colors are also available (please refer to the price list, section A-100 accessories). The final version of the module will be expanded by a switch to select between S&H and T&H.